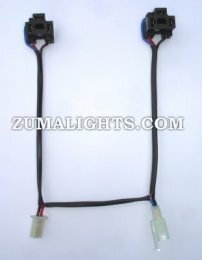 ZUMALIGHTS.COM - Yamaha Zuma Dual Headlight Wiring Harness! Double the performance of your headlights with our kit! You do not need to buy new bulbs and the stock switch will still control your high and low beams. Installation takes about 10 minutes and instructions are included. This harness is safe for your scooter and charging system. It has been road tested by thousands of our customers with no adverse effects reported to date. Note: Adding additional electrical accessories to your scooter could cause your battery to slowly drain depending on many variables. The age of your battery, how it's been stored, how often it's used, proper original charge from the dealer, and driving habits all affect battery performance. Also if your scooter doesn't start right away with the electric start, then more frequent use of the starter could drain your battery more quickly. The first thing to stop working because of a drained battery is usually the electric start as it draws a lot from the battery. The headlights will still work because they are ran off the magneto generator although they may be dim at idle. Adding the Zumalights 49cc harness to your scooter will not cause any damage to your charging system or battery. The most common cause of a drained or dead battery is the key left in the "on" position. Another common problem is corroded battery terminals or a blown fuse. If you notice your battery has drained, charge it as soon as you can with an appropriate battery charger like a Battery Tender. Also, scooter batteries tend to last only a few years, especially when not maintained properly. 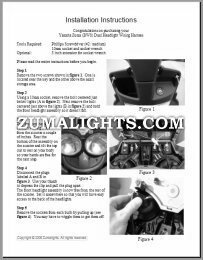 Although we feel the Zumalights Zuma Headlight Harness is a safe modification to the Yamaha Zuma, the harness must be installed at the purchasers own risk. Trav, LLC (Zumalights) shall in no event be held liable for any incidental or consequential damages arising out of the use of this product. This product has not been endorsed by Yamaha Motor Corporation and there is no affiliation between Trav, LLC (Zumalights) and Yamaha Motor Corporation. Installation of the product in your scooter may limit or void your rights under any warranty provided by Yamaha Motor Corporation, and Trav, LLC (Zumalights) assumes no responsibility in such event. Our maximum liability to you shall be limited to the amount you paid for the product.